The temperature dipped below zero, the winds blustered, the schools closed for a couple of days. Snow came a few days ago and covered the sidewalks and rooftops along with the cars parked on the street. As I look out my window now, the wind blows disintegrating chunks of snow off of tree branches and the window air conditioning units that remain, inexplicably, still installed in the building across the way. Which is where this hot and sour soup comes in. It’s exactly the sort of robust, flavorful, warm, brothy bowl of Chinese home cooking that I want when I come in from the cold. 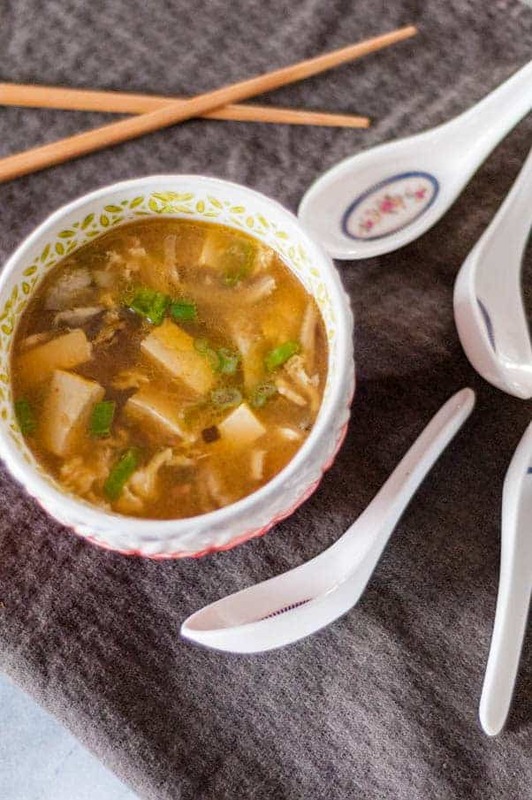 It is based, ever so loosely, on Mama Chang’s hot and sour soup in Joanne Chang’s excellent Flour, Too, a book that is quickly becoming a favorite source for simple and satisfying savory dishes as well as showstopping sweets. This soup comes together quickly. And it’s actually quite simple to make. 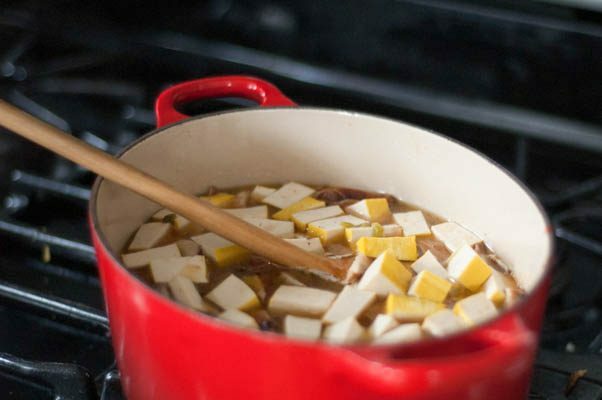 There’s no long simmering to build a complicated broth. Once you’ve done your grocery shopping, you’re most of the way there. 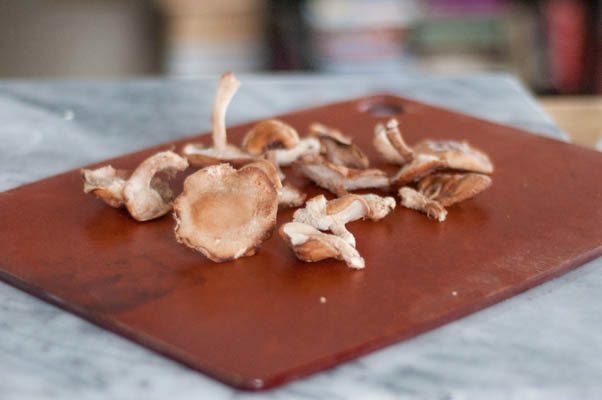 I swapped in all sorts of ingredients–bacon for the ground pork, shiitakes for the button mushrooms, extra firm yellow tofu for the softer more traditional soup varieties–and adjusted the amounts based on what I had on hand. 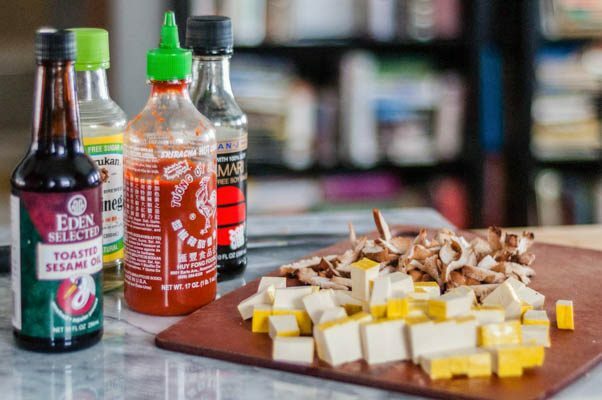 But I kept the basic flavor profile with ginger, scallions, and garlic forming the base and soy sauce (or tamari), rice vinegar, and sriracha bringing the salt, sour, and heat with a drizzle of sesame oil to round out the flavors. It’s a wonderful soup for January, or any cold day. I have a feeling I’ll be eating plenty more of it until the weather warms up. 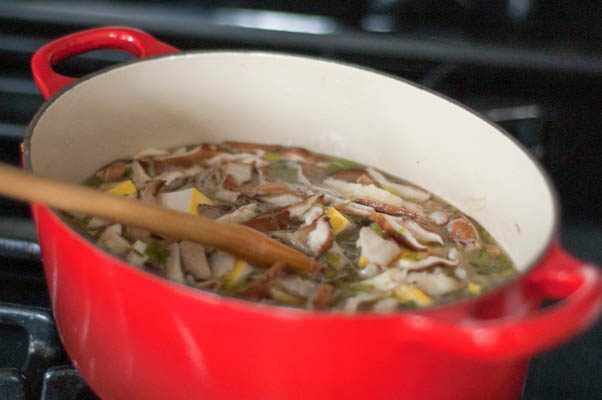 This soup is a hearty, brothy riot of hot, sour, salty and sweet flavors. It comes together quickly and doesn’t need to spend hours simmering on the stove, but it keeps well for several days. 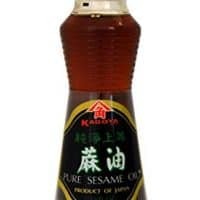 It is gluten free if you use tamari instead of soy sauce and it could be vegetarian if you omit the bacon and use vegetable stock instead of chicken stock–there is still plenty of flavor and enough protein in here that I’m confident it would still be satisfying. 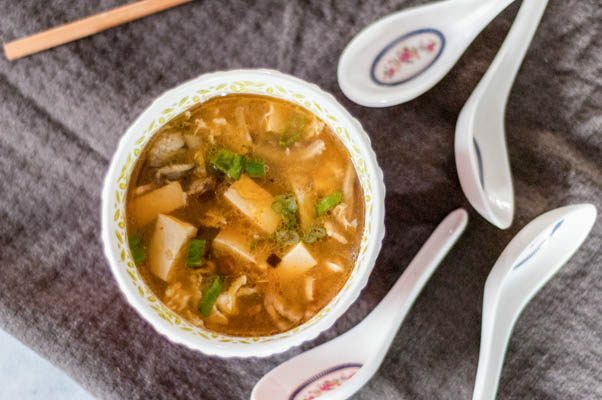 This is definitely not the most traditional version of hot and sour soup out there, but it stays true to the spirit of homestyle Chinese cooking and I think it’s delicious. 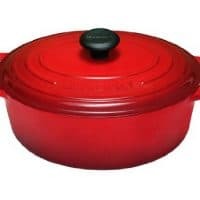 In a large saucepan, heat the grapeseed oil over medium-high heat, add the garlic, ginger, and scallions (except those reserved for garnish) and saute for about a minute, or until fragrant. Add the bacon and saute, stirring frequently until browned around the edges, about 5-7 minutes. Add the stock and bring to a simmer. Add the tofu, mushrooms, sugar, rice vinegar, soy sauce (or tamari), sesame oil, and sriracha. Return to a simmer. In a small bowl, whisk the eggs until the whites and yolks are blended, then stir into the simmering soup where they’ll form strands. 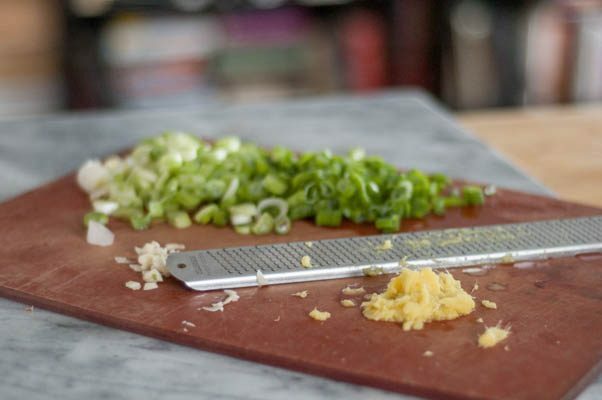 Ladle into bowls and garnish with scallions and a drizzle of sesame oil. Excellent soup, I used dried mushrooms soaked in broth. Husband said it was the best he had ever tasted. Love your spin on the classic hot and sour soup. Anything with bacon and soup and I’m in! I was so into this until you got to the egg part. I’m confused. Does hot and sour have eggs in it!? I thought that was eggdrop soup… is this like both soups in one? I’m so confused. I’ve recently discovered there are many regional differences when it comes to Chinese food. My chow main and California’s chow mein are not the same thing. Kathryn, most versions of hot and sour soup that I’ve encountered have eggs. The eggs in the soup are similar to egg drop soup–they’re basically cooked the same way in the broth. If eggs like that aren’t your thing, you could always leave them out. This just looks fantastic! So wonderful! Yum! I love new soup recipes now that the weather is cooling off. Thanks! Thanks! This one hits the spot for me.